Hello Friends! Welcome to my 46th Thread Talk installment. It’s been absolutely fun to share with you all that I have learned in my machine quilting journey. 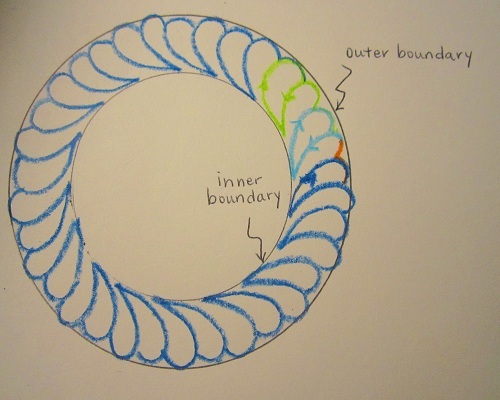 #1 Evenness, or rather the visual perception of evenness in quilting density, plays an important role in allover quilting. 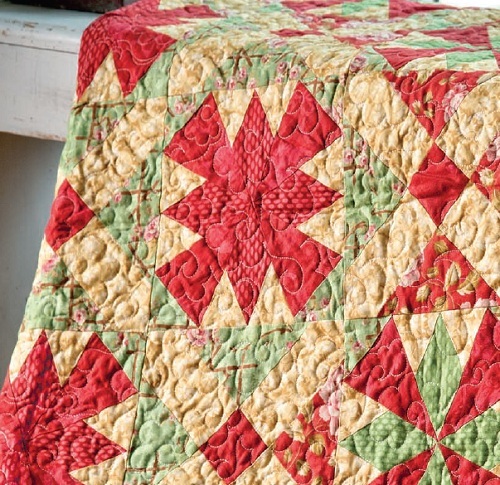 Evenness in allover quilting gives the viewer a sense of continuity, and uniformity. 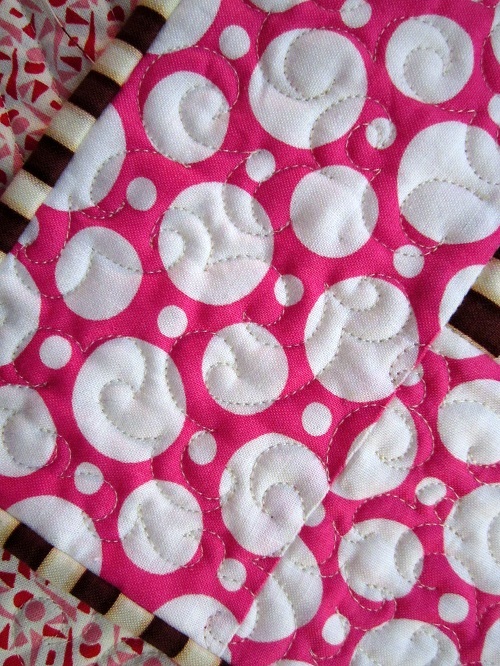 #2 The quilting density has to do with the spacing between individual quilting motifs. The spacing can be tight or loose, but as long as the overall scheme in spacing is even, one gets the visual sense of a well-quilted quilt. 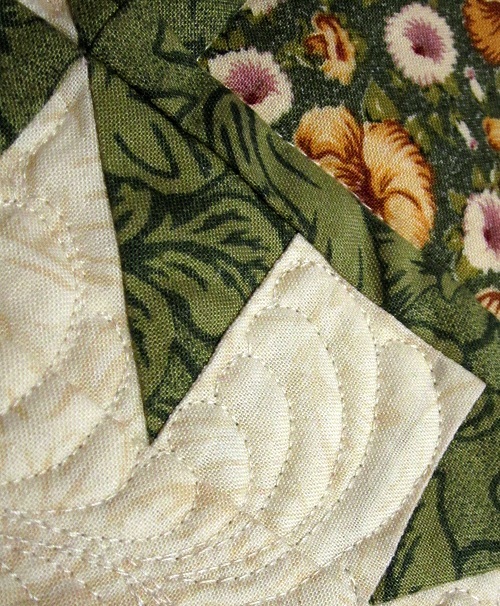 #3 I think the difficulty in achieving even allover quilting (quilted on a domestic machine) comes in when domestic machine quilters have to contend with the very limited visibility afforded by the small quilting area under the small throat area of the machine. a. 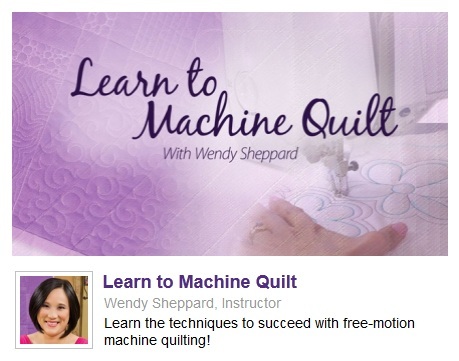 Start with training yourself to quilt even echoes free-hand! I have written specifically about echoes here. Quilting echoes free-hand trains the quilter to master moving her quilt sandwich, as well as to use the eye to gauge distances. If you haven’t tried this before, try quilting echoes roughly 1/4″ apart as a practice to get you used to gauging distance solely visually. Now, you will notice that the spacing between your echoes is not always going to be exactly 1/4″, but close enough when you find that your echoing effect is starting to look good. 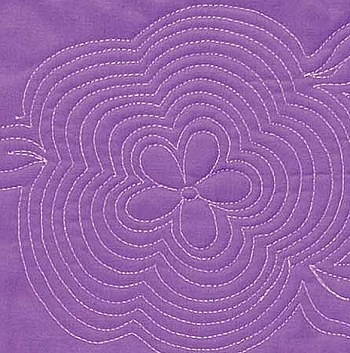 Being able to gauge the spacing between motifs when quilting will help you quilt your motifs evenly. b. 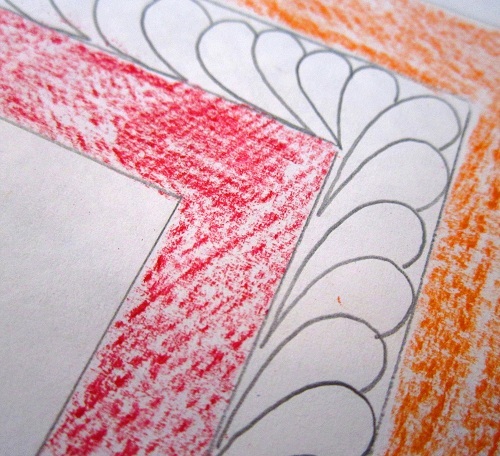 You might doodle on paper the quilting motif roughly the same size as you would quilt on the quilt. That gives you an idea how many repetitions of the motif you will be able to quilt in the quilting area afforded you by your machine once you get the quilt sandwich under the machine throat area. 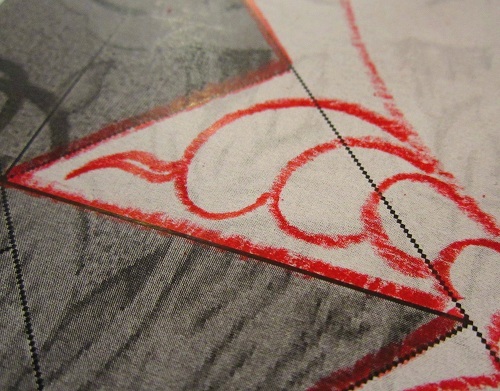 c. Make sure you know your motif well before you actually stitch/quilt it on the quilt. 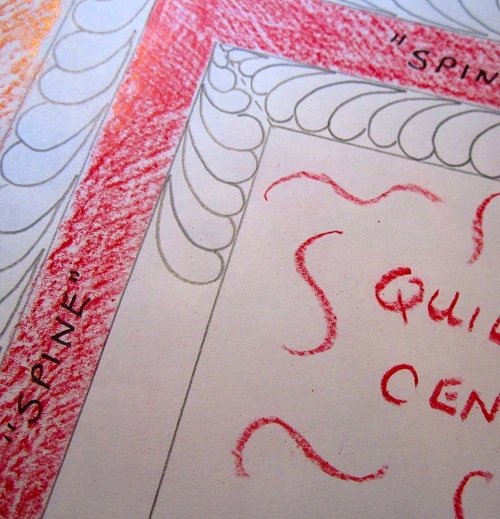 There is nothing more frustrating than not knowing where to go next during the actual quilting process. 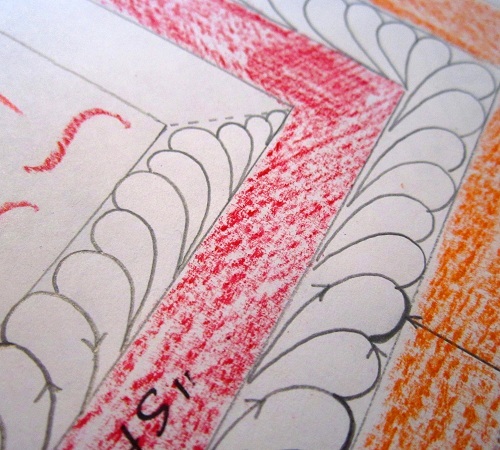 If that still happens when you know the motif on paper better than your own name, that’s not the end of the world — just stop and take a deep breath and do a bit of surveying as to where you would go to fill up the immediate quilting area. d. I generally have to spread my quilt out on the floor from time to time on to see if I miss any area that still needs to be quilted. I see this as a fact of life when one quilts with a domestic machine. I have made mention of this point in this Thread Talk post. I hope this helps you gain more confidence in achieving pleasing quilting results in your quilting journey. Click here, here and here for a few Q&A posts I have done in the past. Thanks for stopping by! I plan to share a recent magazine quilt before the weekend ends. My latest featured projects are slowly making their way back to me! Have a great day! Hi Friends, I hope you are well. #1. I made sure I mastered the basics first in small scale before moving up. 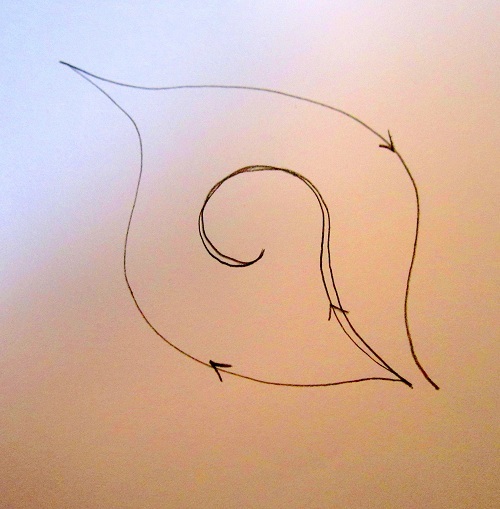 The “basics” in this case is my swirly vine. 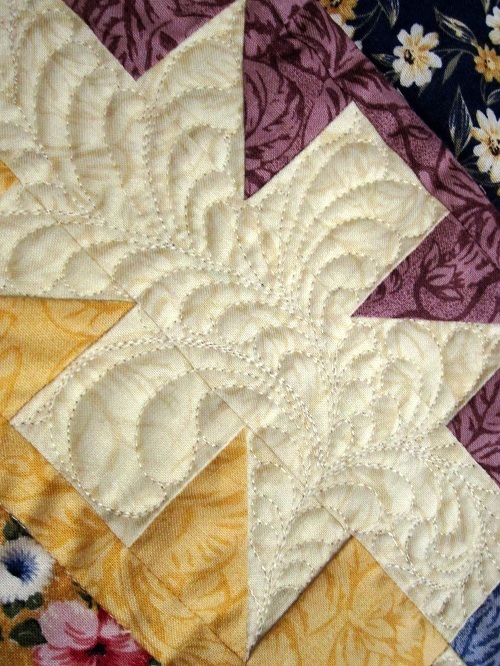 I made sure I was able to quilt the motif well with all the curves being quilted without any jaggedness before moving up the scale. You can read more about the swirly vine in a Thread Talk post here, or you can see it done in my “Learn to Machine Quilt” online class here. #2. I made sure I also mastered totally free-handing the motif and am able to quilt the motif comfortably all over the quilt before attempting to add any fancy strokes. 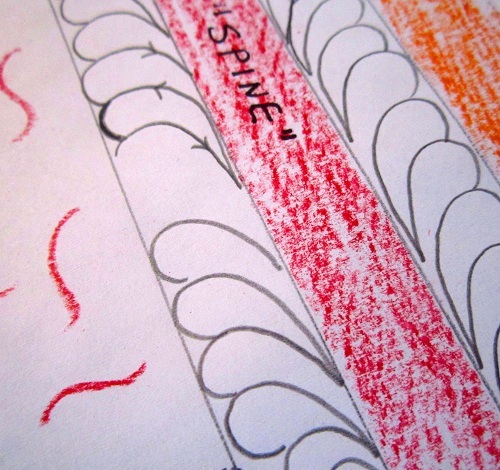 If you aren’t comfortable in quilting free-hand, you might consider doodling on paper first. 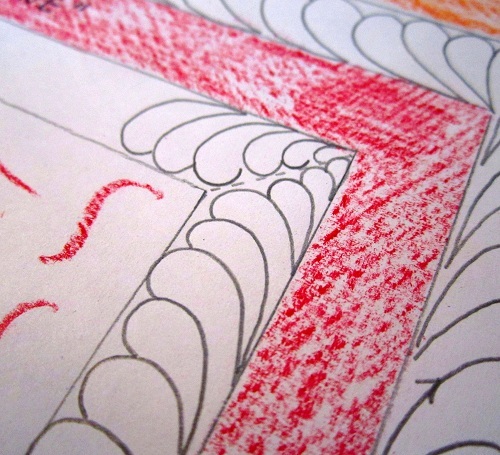 I place great value in doodling on paper in my “Learn to Machine Quilt” online class. 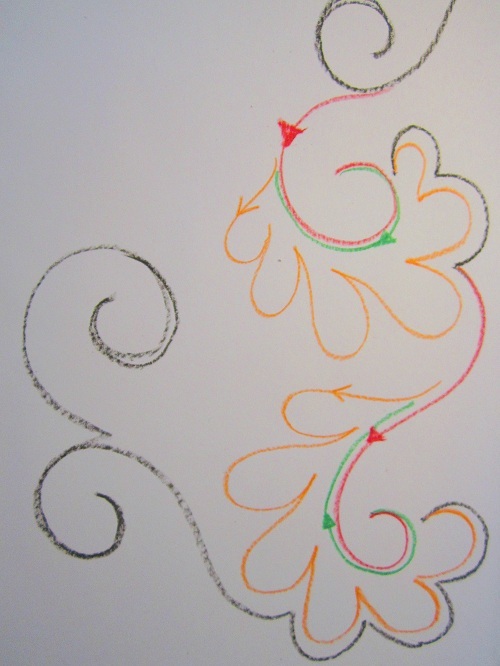 Now, if you are past #1 and #2, and are ready to dress up the swirly vine motif and make a totally quilting motif out of it, here are the schematics. 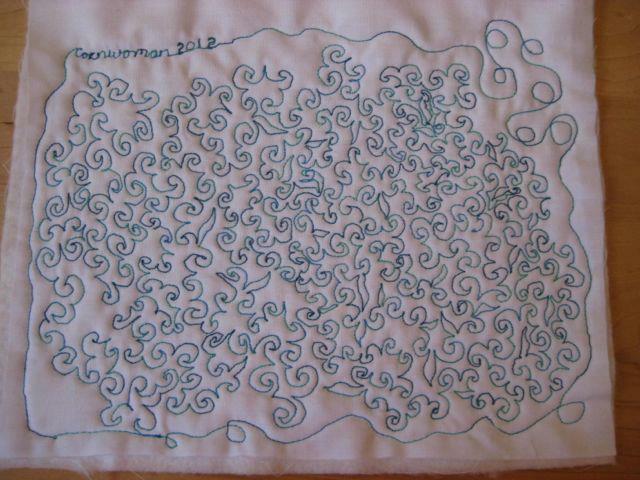 These are the swirly vines drawn in a much larger scale. 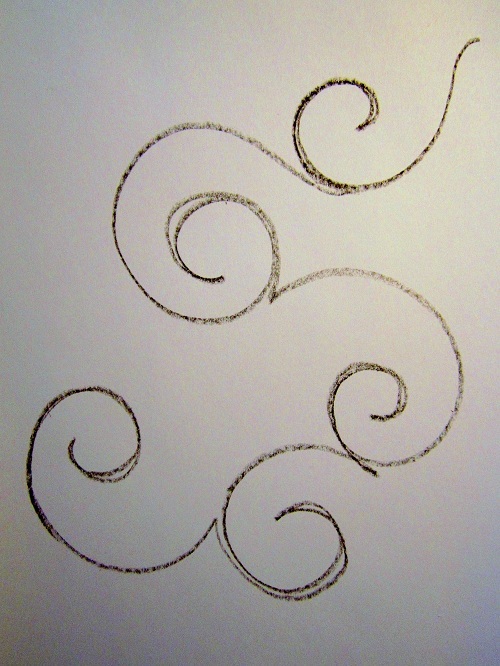 The starting swirl at the top right corner is about 2 1/2″ in length just so you get an idea about the scaling. 2. 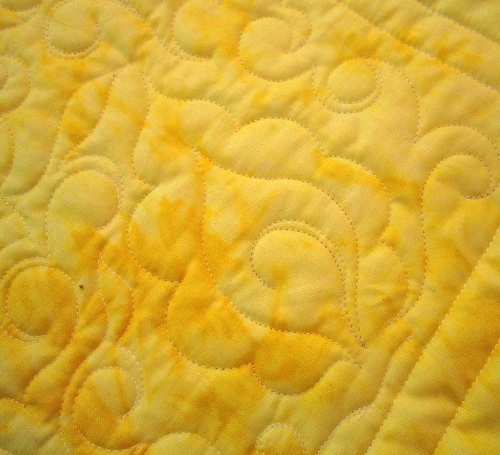 If you are comfortable quilting these swirls with no major hiccups, you can add some petal lobes at the base of the swirl before you head off again to start another swirl. See if the following schematic makes sense to you. 3. 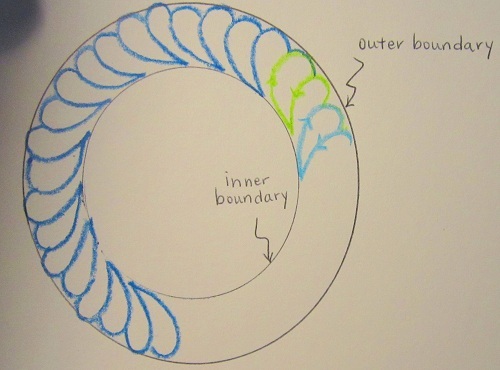 You only have to echo around the lobes to get out to start another swirl. See what I mean? 4. Repeat until the quilting area is quilted. 5. Here, you see the quilted reality. I hope this gives you an idea on dressing up the basic quilting motifs you have been using.Thanks for stopping by. Hugs to you all! Hello Friends, I finished a quilt for shipment over the weekend. This quilt is a little different than the ones I normally do because it is a quilt without borders. 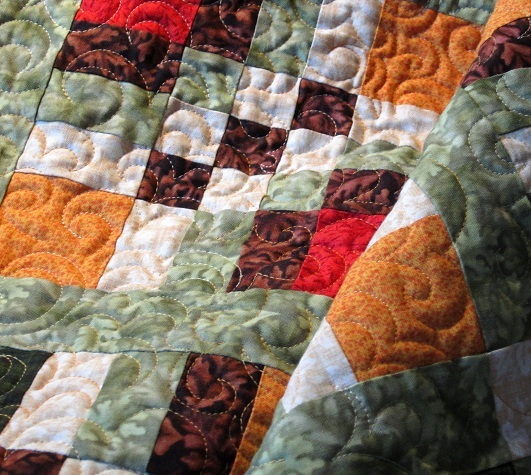 The border-less quilts have gain popularity lately, and I have been requested to make several of them this year — stay tuned for announcement of official features! Quilting border-less quilts presents different challenges in that the assuring thought of trimming off the borders to square up the quilt after quilting is NOT there. So it is of paramount importance that your pieced quilt top is squared up and flat even before quilting. 1. I found that using batiks that are of higher thread count instead of regular cotton helps with maintaining the square-ness of the quilt. 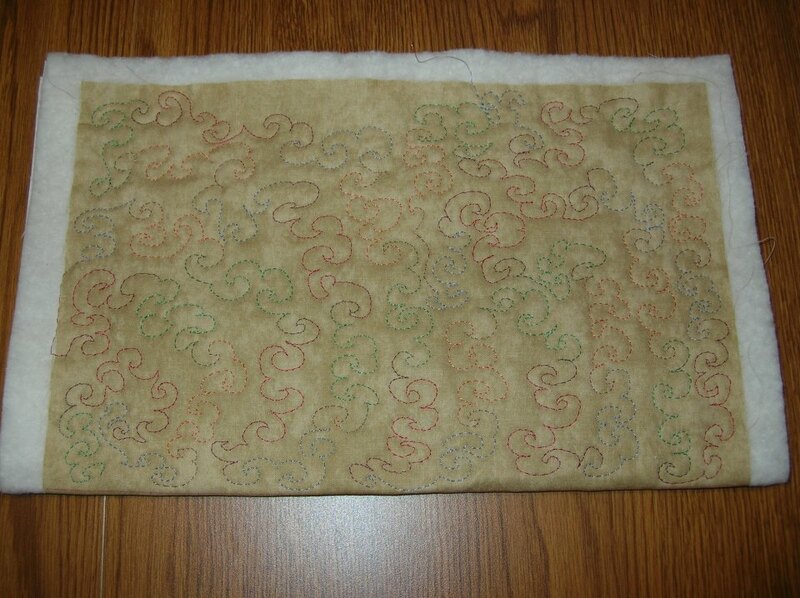 I have made border-less quilts with both types of fabrics. With the regular cotton fabrics, I just make sure I starch my fabrics and block patches during the construction process. 2. Use a lighter weight batting for easy maneuver — I use silk instead of cotton (I actually already use almost exclusively silk anyway). 3. Before I quilt, I also trim my batting and backing even with the quilt top, and zig zag around the quilt corners with loose zig zigs. That tends to keep the corners from getting wonky being pulled in the quilting process. 5. 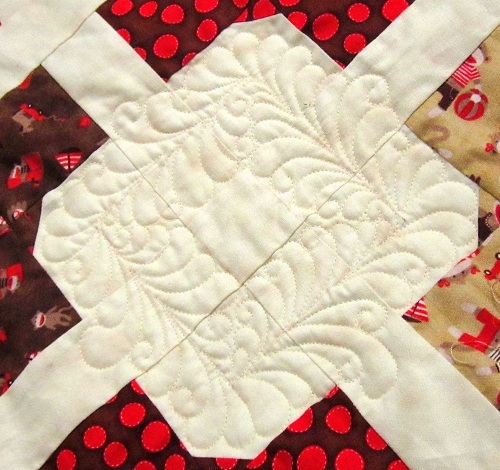 I quilt with slightly longer stitches when quilting in the ditches when it comes to quilting border-less quilts. I find that there is less puckering, thus the square-ness of the quilt is preserved. 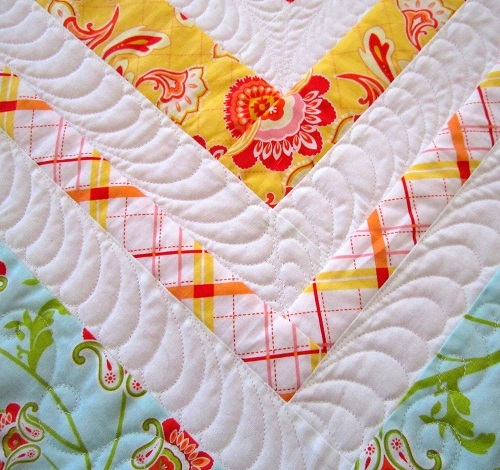 I hope these tricks make quilty sense to you. 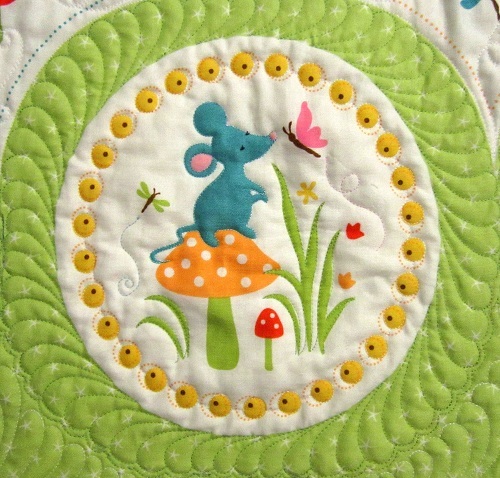 I am sorry I don’t have any pictures to show you because none of my border-less quilts are officially published yet! So, what is your feeling toward quilts without borders? Thanks for stopping by. I shall catch up with you later. If you look at the image below, you will see that I added little “what-nots” at the tip of some feathers to fill in the geometry of either square or triangle patches. You can see in the following the aforementioned “what-nots” in action. 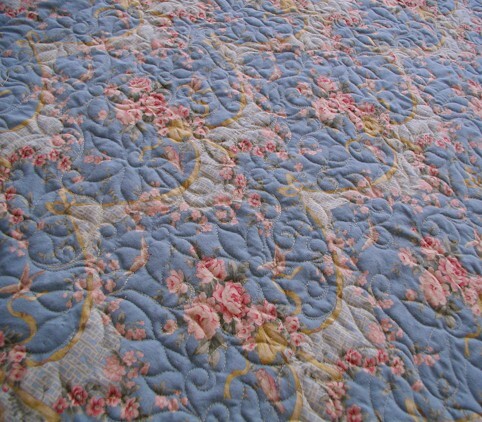 You will need to study the images a bit to find the “what-nots” since the quilting was done tone-on-tone. 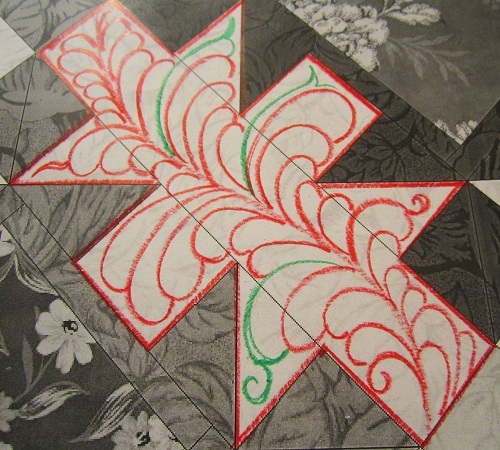 I hope the “what-nots” trick would come in handy for you when you are quilting feathers to fit quilting area of fixed geometry. 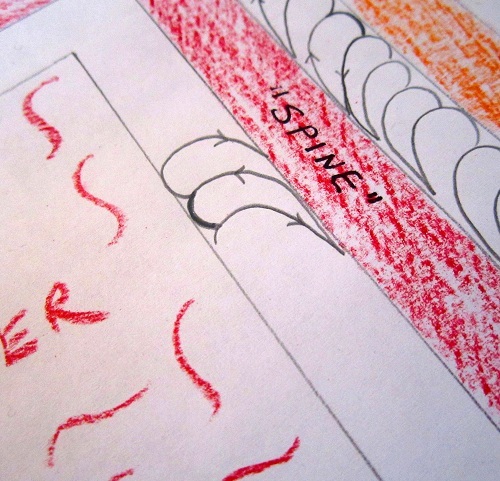 Notice this post does not deal with how to quilt feathers — that topic is already covered here. Thanks for stopping by! A huge quilty hug to all my friends! Dear Friends, I hope you are doing well. Life has been sort of a blur for me in the last few days as I worked to meet a few non-negotiable deadlines! 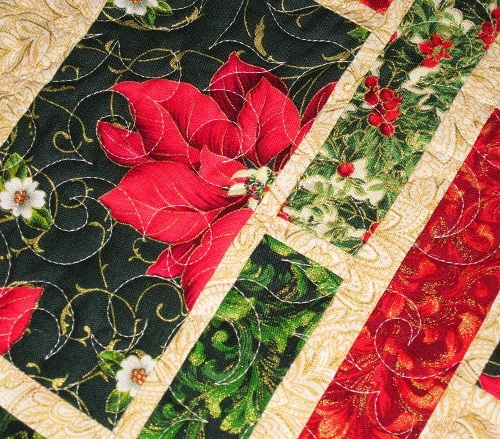 I had heard from some of you that you were not able to leave comments on my Cottage Chic Christmas quilt. I am sorry about that. I am not quite what was wrong. I am guessing whatever it was, it was temporary on WordPress’ end. You will see what I mean by comparing the previous photo with this next one. Since all the feathers are the same size, the feel is more uniform and more formal. Moral of the story: Experiment with the sizes and styles of your feather lobes to achieve different looks. Thanks for stopping by! I will see you again tomorrow, hopefully. Happy Friday, Friends! I hope you have had a good week. I want to thank you all for chiming in on quilting ideas for this image I had shown you earlier this week. 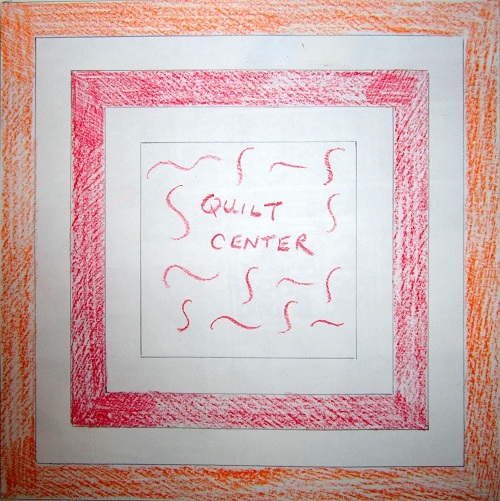 I enjoyed reading creative quilting ideas. A quick recap on the quilting area: it is rectangular, measuring 4.5″ (width) and 5.5″ (length) with a 1.5″ square in the middle. So, while 4.5″ x 5.5″ sounds rather large, the “white” area is really not that large after it’s being “intruded” by that square in the center. 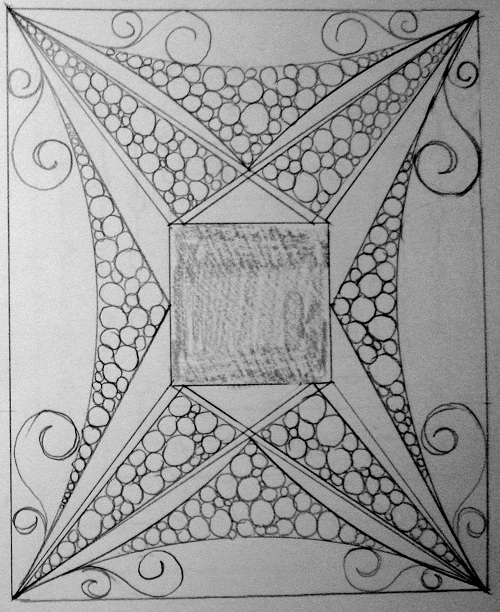 With that in mind, here is option 1 – classic geometric with fillers giving the area the illusion of a separate pinwheel block in the background. Option 2 – a fun free-motion echoing around the square with straight lines and circles. 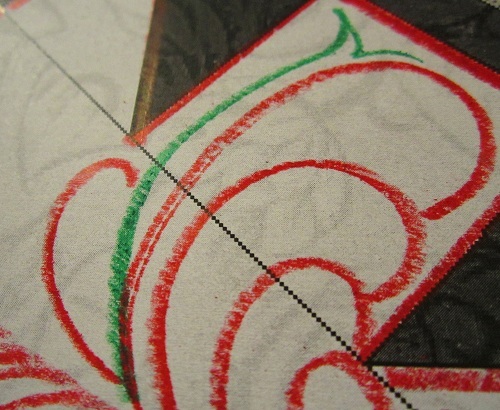 Option 4 – geometrical lines are used to give the illusion of a paper-pieced block. 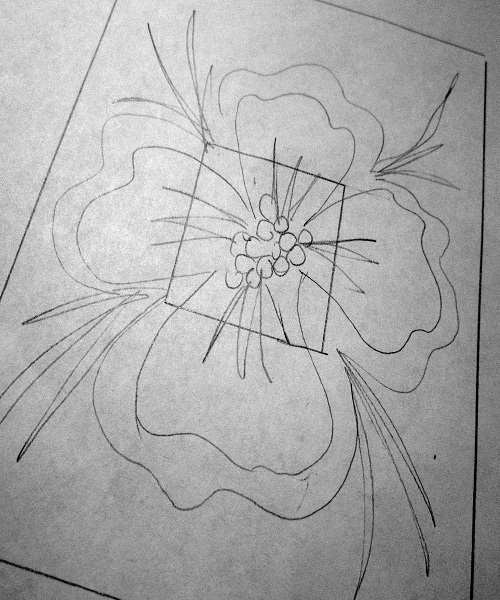 Option 5 – A free-handed floral motif radiating from the center of the square. Now I will share with you how my little brain synapses processed those options. #2: No marking required (yay! 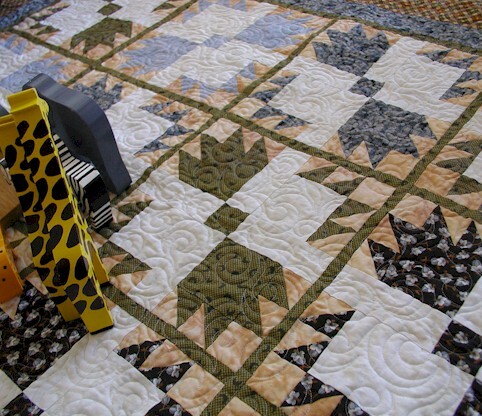 ), but since it is rectangular, it will be hard to make sure the echoes around the square to evenly fill the rectangular quilting area. The schematic showed that toward the top, there is a gap. 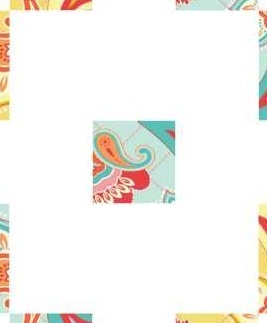 Would be perfect for a square quilting area, but not rectangular. #3. Love this, but the marking will require some time. #4. 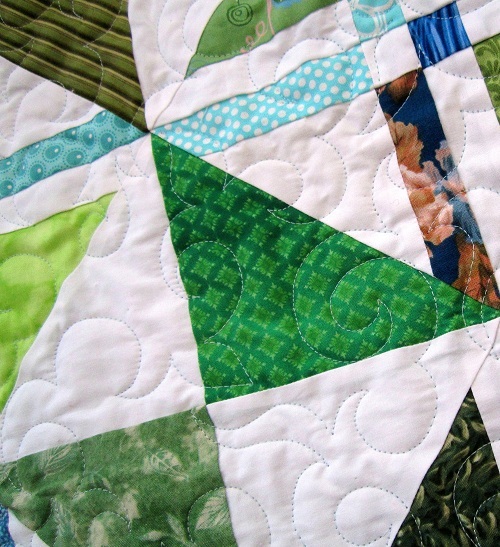 Love, love, love this – how I wish I had six months to quilt this quilt, and not just 6 hours! #5. Definitely a viable candidate as there is no marking involved, and the symmetry issue isn’t too much of a concern. 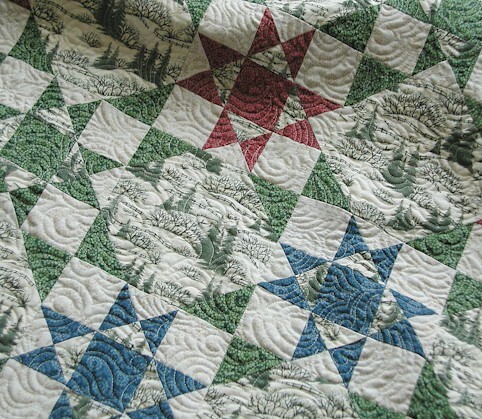 But might not go with the general feel of the quilt. Unfortunately, I can’t show you the entire quilt for now. I will though, soon enough! 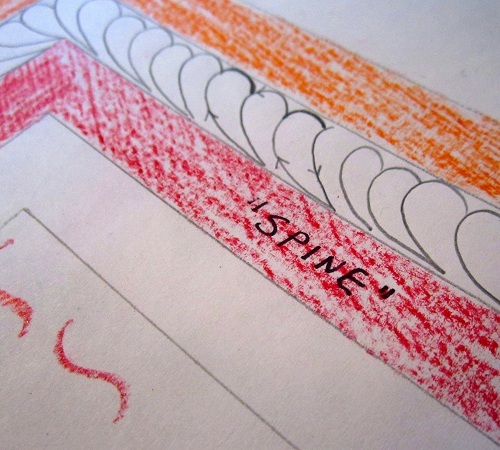 The suspense is over — this is what I ended up doing… a spineless feather wreath to fit the rectangular area. My first attempt at quilting rectangular feather wreaths turned out to be more than satisfactory in the visual effect department. [You can click here to read about how I free-hand my feather wreaths.] Quilting went really quick, and with minimal marking. 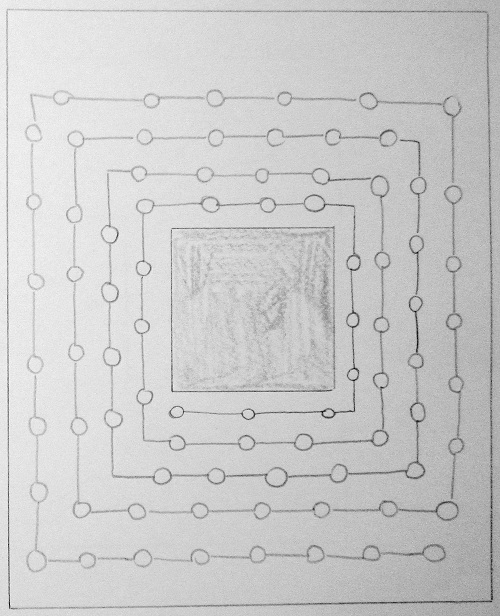 I used a wine glass to draw a symmetrical boundary around the square so that I know where to start and end my feathers. That was the only marking I had to do. The feathers were all free-handed. 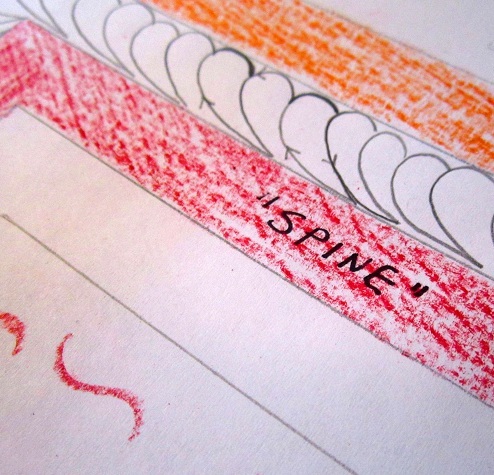 I hope this post gives you a glimpse of what goes on behind-the-scenes where Ivory Spring quilts are concerned! So much of what I do at this point in my life is directly related to time management… and I do sometimes look forward to the day I can finally spend 6 months quilting a quilt! But until then, my world is constantly whirling at top speed. Thanks for stopping by. I hope you have a lovely weekend ahead of you. I will see you again on Monday. Mary expressed, “Here’s my August “Jester Hats”. It wasn’t a natural pattern for me, but eventually I got a rhythm going. My main problem at this point is how to avoid stitching myself into those blind alleys in order to fill the good sized empty spaces. I get stuck at the end and can’t get out without it looking right. Any suggestions on how to get out gracefully…or to keep from having the blind alleys to begin with? 1. I try to always divide a quilting area in to smaller areas, and make sure those are filled before I move on. That seems to help reduce the number of times I quilt myself into a corner and can’t get out. 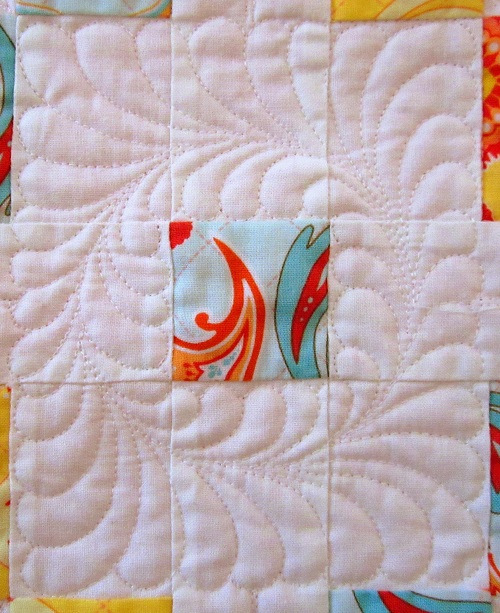 Some think that free-motion allover quilting is random. I don’t quite think that way. Perhaps it’s my engineering background, I see allover free-motion quilting as a motif being evenly repeated and distributed over a given space. It is only random as much as the actual quilting of the motif isn’t (entirely) planned out for a particular spot until I reach that spot. But when I reach that spot, I still have to decide how best to execute the quilting to best distribute the motif in the area at hand. So to tie in with what I said in the beginning…. 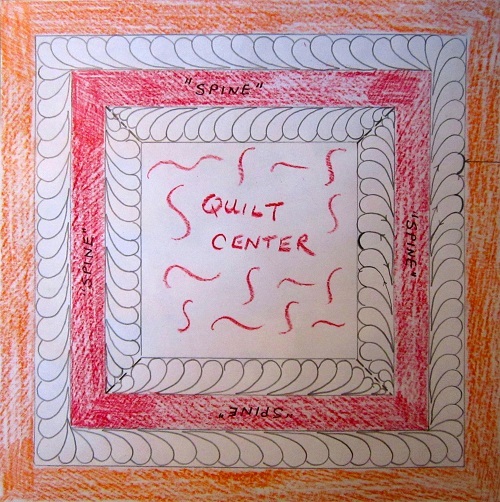 if I am quilting an area of 8″ x 8″, I would mentally divide my area into 4 – 4″ x 4″ areas, and decide how best to quilt, repeat and distribute my motifs within the areas. 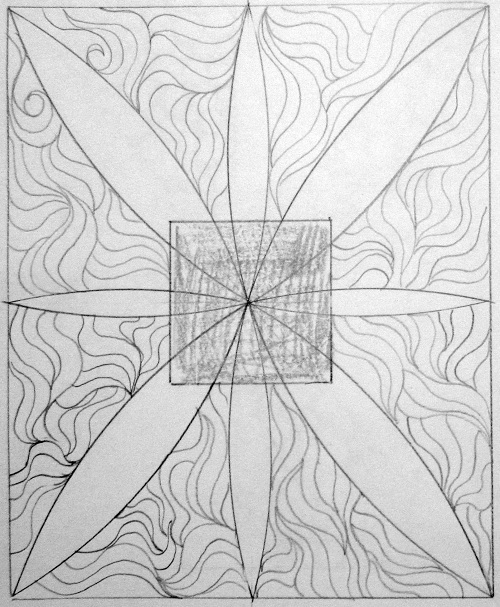 I try to fill the first 4″ x 4″ area before moving to the next 4″ x 4″. 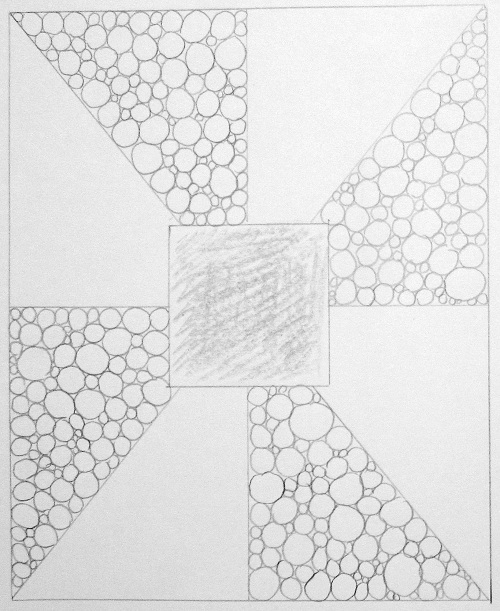 If that still seems daunting, I try sub-divide a 4″ x 4″ area into 4 – 2″ x 2″ areas, and go from there. 2. If, for some reason, I stitch myself into a corner and can’t get out – that’s not the end of the world. I think it’s a natural occurrence (and something bound to happen) because of the limited visibility when quilting with a domestic machine. It is okay when and if that happens. In situations as such, I just pick a spot in the un-quilted area to start and repeat the motif again until the area looks quilted evenly and blended in with the rest of the already quilted area. 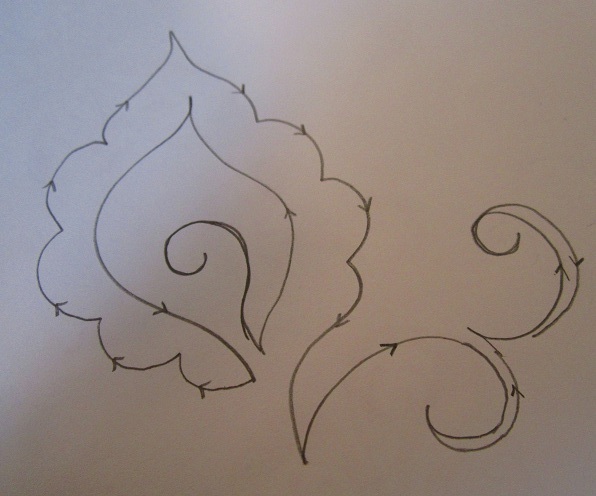 This principles doesn’t only apply to the Jester’s Hat, but all types of filler motifs. 3. 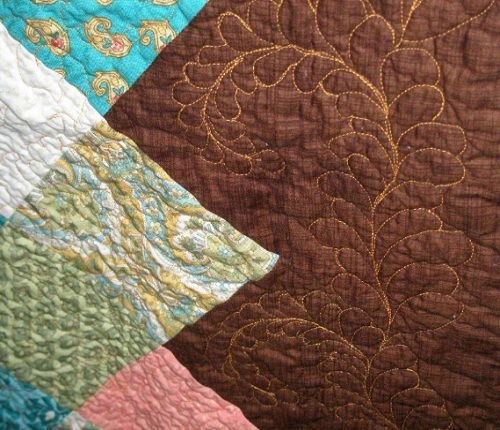 The other point I thought I would bring up (even though it might really obvious to many) is that free-motion quilting doesn’t mean you have to just keep going and going and going while you quilt. I often stop to consider where I should head next with my quilting path. I couldn’t agree more with Jacque regarding my gratitude to SewCalGal for organizing the Free-motion Challenge! 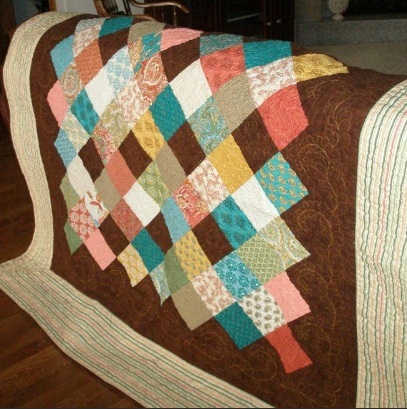 And I am most thrilled to hear from quilters like Jacque that her skills are improving! 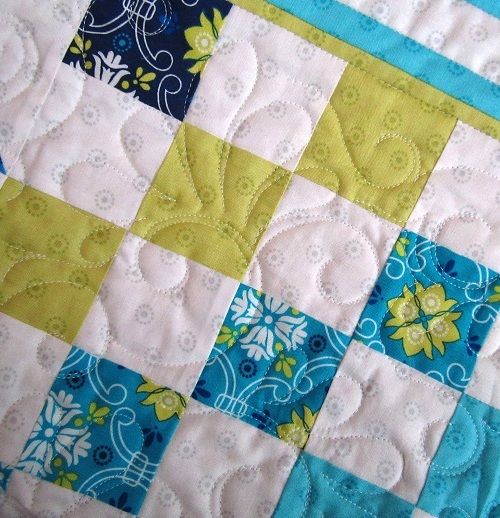 Well Done and Happy Quilting to all the Free-motion Challenge quilters! Now one more thing for those who are trying out Jester’s Hat — from the pictures I have seen, many have done their “jesting” on the small-scale. Try enlarging the scale, and you will see that Jester’s Hat transform itself to a rather different look. With that, I bid you a lovely day!! 1. Reducing the machine speed wouldn’t really help because the machine is not feeding the quilt anymore, you are! 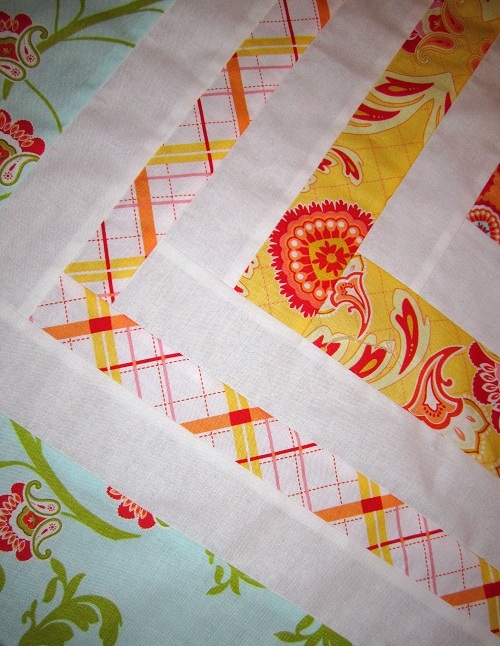 So try reducing the speed with which you move your quilt so that you are literally stitching one stitch at a time. That should help tremendously. 2. 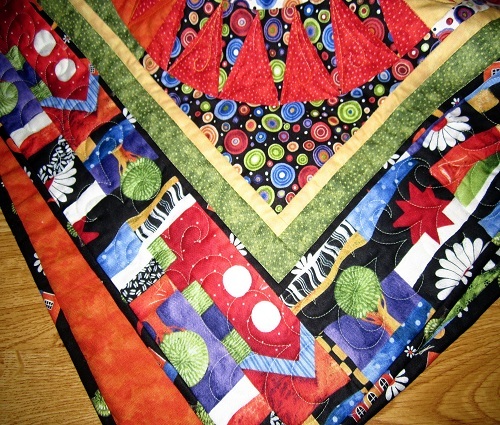 Re: backtracking – I will really slow down the way you move your quilt (see #1). The other thing is to watch where your needle lands when you are stitching slowly. That will train your eye to eventually anticipate a couple of stitches ahead of your needle – that will help you know where to go, and that will help with the accuracy of your stitching path. 3. 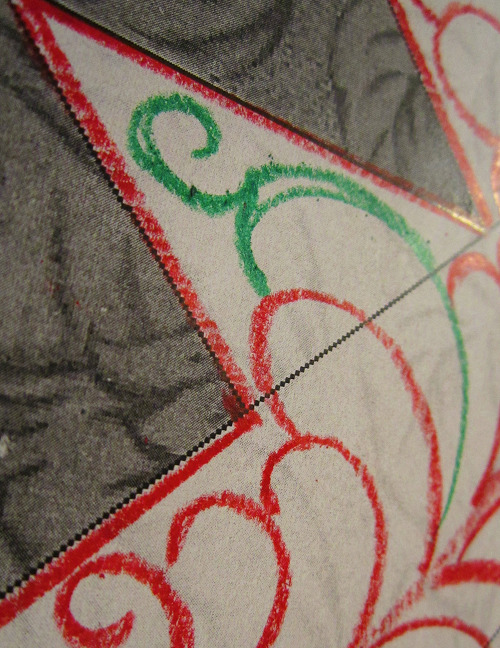 Re: quilting foot – I almost exclusively use the open toe foot because it gives me the best visibility. 4. 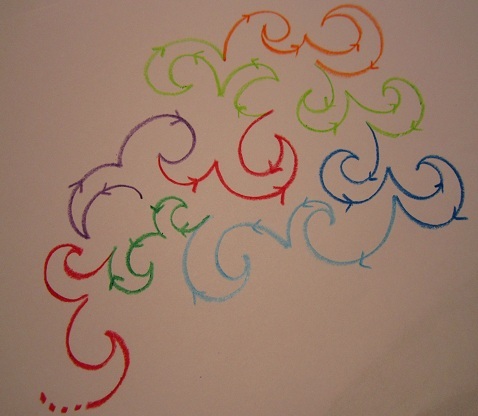 Re: funky plumes and not sure where to go – Keep doodling on paper until you get a nicely formed feather plume, and then move the “doodling” to your quilt, except this time use the needle to doodle instead of a pen/pencil. 5: Re: more practice – Absolutely! 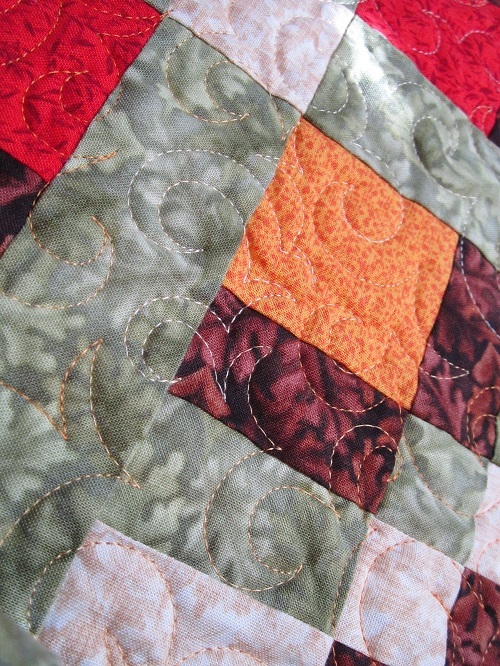 Keep up with the quilting, and you will for sure improve! All those 2 cents said, I think the quote of the day is Jean saying “At least I’ve progressed from “in the ditch” and stippling on every quilt…”! I absolutely LOVE the fact that Jean stepped out of her comfort zone, and did something different and brave. For that, Jean deserves a huge round of applause. We are ALL learning in this quilting world, and in life! So I say to Jean, “Keep up the good work!”. I hope Jean’s story encouraged you today to try something new and daring, not necessarily “quilty” in nature. 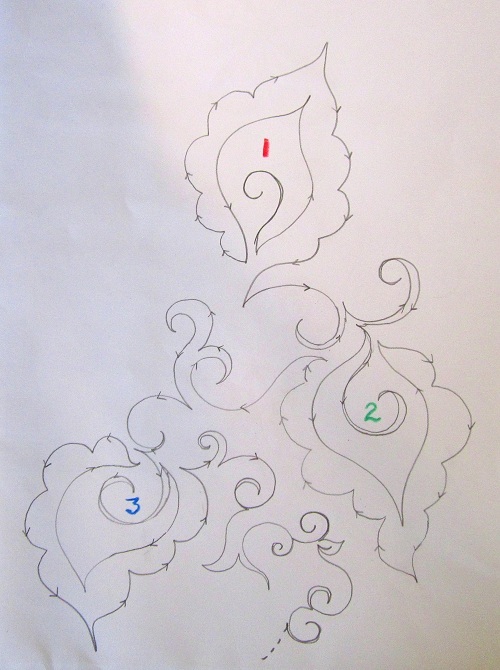 I caved… I gave in and succumbed to your request to see the schematic of that leaf/petal quilting motif combo! THANKS EVERYONE, for all your kind words on that motif. I won’t be able to respond to you personally due to the time crunch I am in right at this moment. I hope you understand – please know that I truly truly appreciate hearing from you. I adapted the center using a swirl because I thought I would just start out with something familiar to me — I only have about 6 hours to quilt the entire quilt. So here is my stitching sequence. 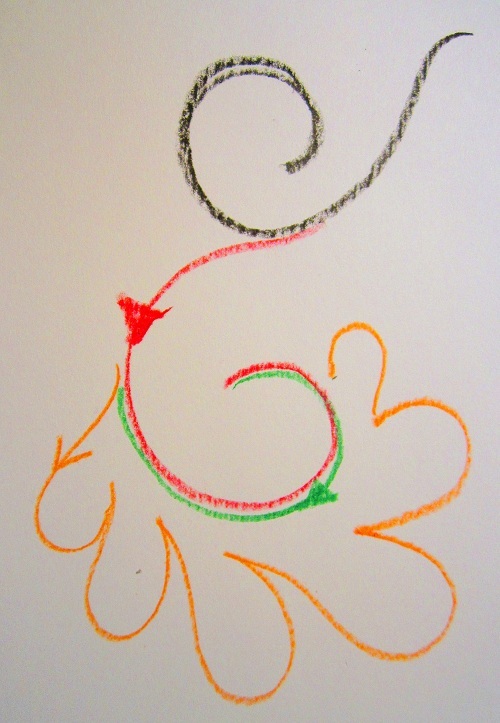 I started out with a swirl, up and down to the starting point. 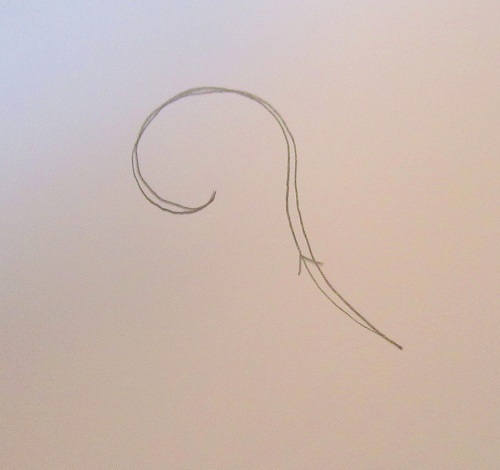 And then, I stitched out a leaf outline around the swirl. 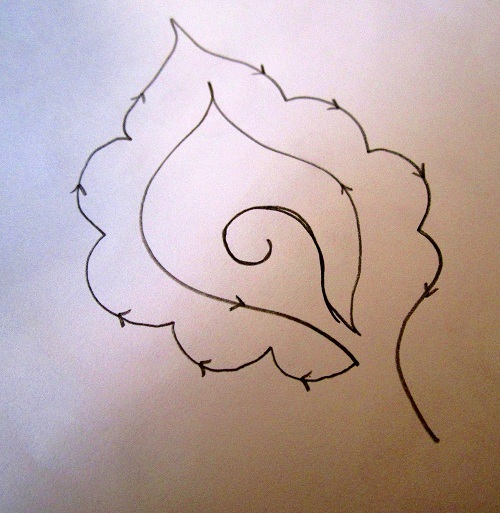 Then I scalloped around the leaf outline. 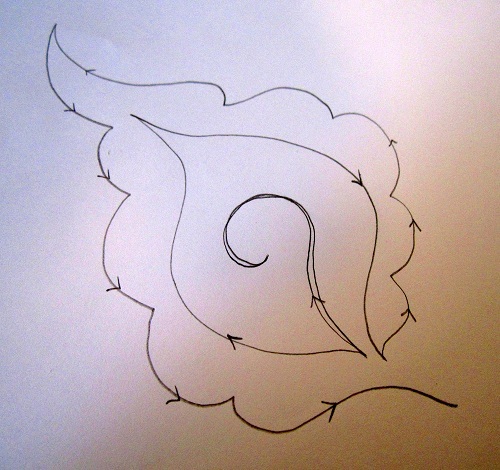 Here you see the same motif with the leaf outline started from the other side of the swirl bottom. 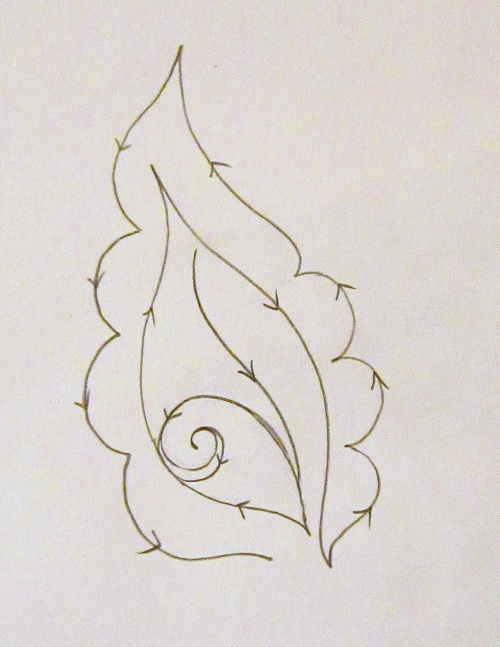 Then, it’s a matter of filling in with random swirls and vines and what-nots until you feel like swirling with another leaf/petal motif again! 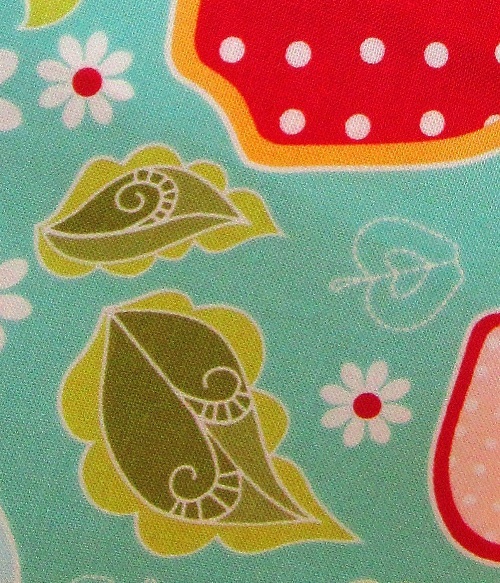 The wonderful, wonderful thing about this motif is that it doesn’t require exact precision on the stitching path. The general look is a lighthearted one so that you can have one scallop a little wonky, and one scallop a little crooked, and the motif will still come out as charming as can be! VERY very forgiving! 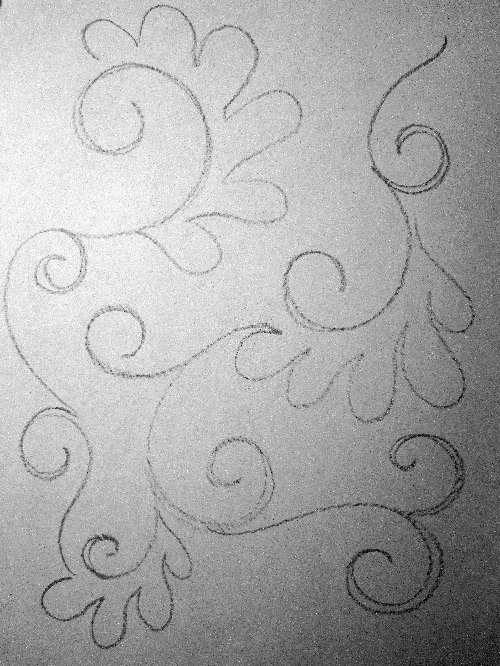 So I had a few minutes before church to actually sit down and doodle a bit, and I was able to come up with a quilting motif that looks more like the original leaf on the fabric. 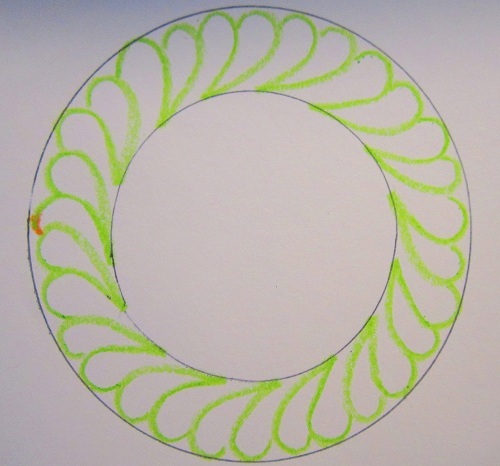 This time you would start with the leaf vein before the swirl in the center, and and then just follow the same sequence to complete the motif. 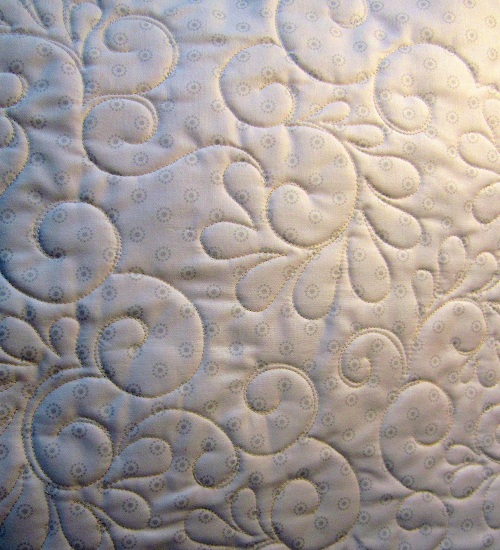 I hope this post gives you more ideas on what to quilt on your precious quilt tops. 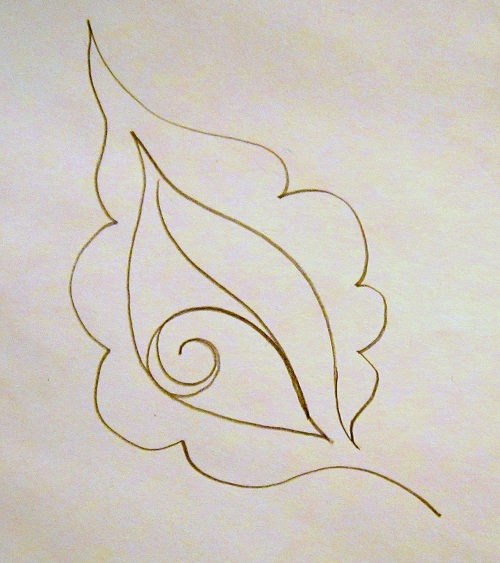 Meanwhile, I will work on more adaptations of this leaf/petal motif. I will let you know if I come up with more ideas. So I caved, I gave in, I succumbed…. I hope I have delivered as well. Thanks for stopping by. Happy Monday, dear Friends! Welcome to another Thread Talk installment! As promised, I will share with you the way I quilt unmarked feather wreaths! Now, though the feathers are “unmarked” and free-handed, we do need some way to mark or delineate the boundaries of the wreath. 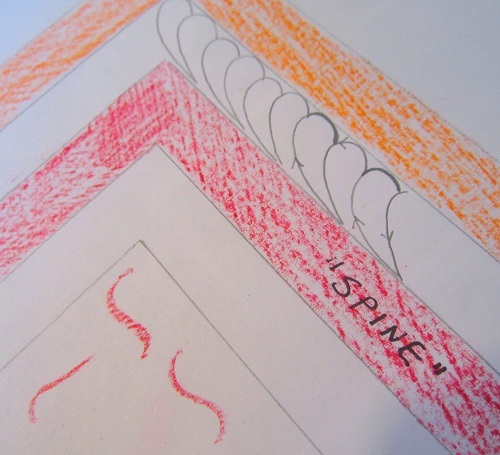 Sometimes the boundaries are already apparent on the fabric, as in the case of the above picture. 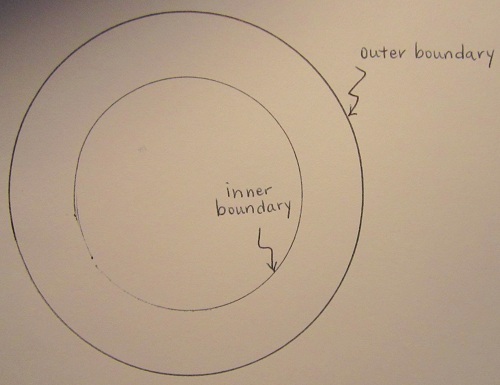 But if not, it is perfectly okay to mark the inner and outer boundaries — using those household items and a marking pen! For the schematics below, I used Miss Baby’s toy dishes. 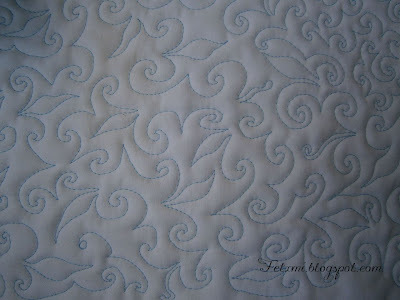 One thing that will help is the ability to comfortably quilt feathers unmarked and free-handed. Click here for my previous tutorials on the stitching sequence I use for feathers. To start, I only “half-form” the first feather. The reason is that I wouldn’t know how well my last feather would match up with the first feather once I come around the wreath. Not fully forming the first feather allows me room to “doctor” the first feather for the wreath to flow nicely (or rather, as nice as possible). 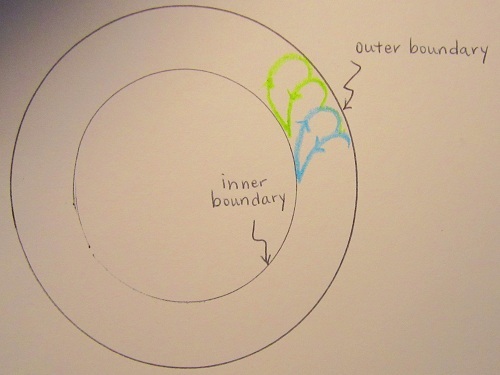 I do a little backtracking from feather to feather, as you see the different colors on top of some of the feather lobes. You can quilt your feather wreaths with your feathers going in the opposite direction too! 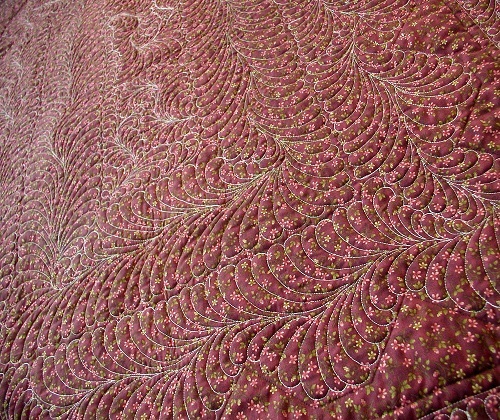 That orange blob is where I had to touch up the first feather after I quilted the full round of feathers. Combining these wreathes in different directions create an interesting visual effect! I hope this makes sense to you. Happy feathering, my Friends! 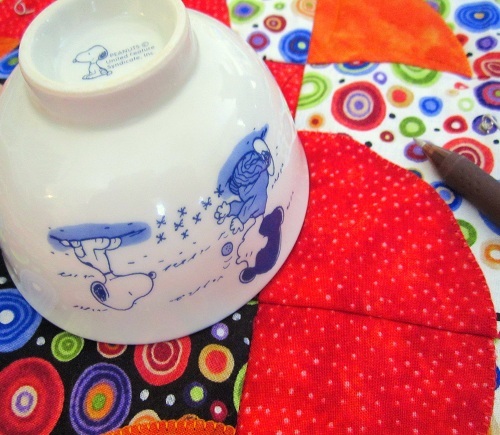 I often use dishes to mark my quilts. That Snoopy bowl above is one of the more frequently used. The other one is a 13″ service plate. 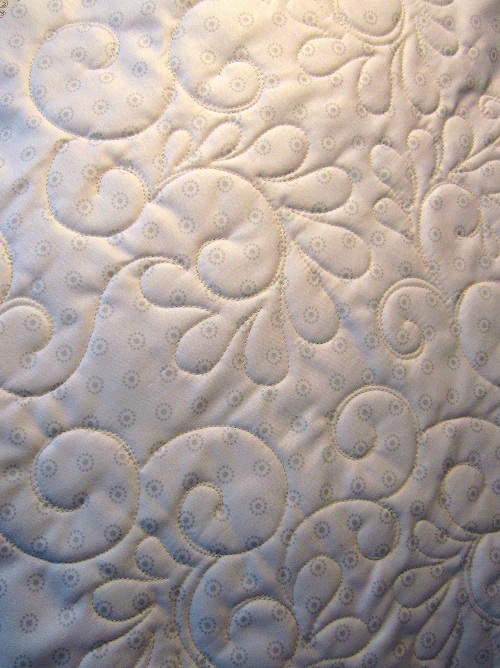 Since many of you have many more years of quilting experience than I do, I am curious to know what other household gadgets you have used to mark your quilt for quilting. Thanks for stopping by. I’ve got to run for now. Take care.